Our logo features the traditional quilt block pattern “Gristmill”. We chose this pattern to celebrate and honour the heritage of Cavan Monaghan Township. Mills, every bit as much as barns, were an essential part of the history of Cavan Monaghan--both gristmills (for grinding grain for food for humans and livestock) and sawmills. While gristmills and sawmills were the most common, other water-powered mills operated in the Township. These planed lumber, produced veneer, cut wooden shingles, processed flax for linen, carded wool and wove woolen goods. At one time there were over 25 mills in operation throughout the Township. Imagine almost every good-sized stream with its millpond and mill! 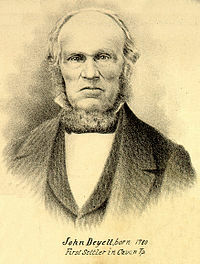 The first mill in Cavan Township was built in Millbrook by John Deyell, who was one of the earliest settlers. John Deyell was a remarkable man. He fought in the War of 1812; returning to Europe he fought at the Battle of Waterloo. Before settling in the Township, he was one of the surveyors who plotted out the Township in 1817. In fact it seems he was responsible for naming the then two townships Cavan and Monaghan. A stained glass window in memory of John Deyell and his wife can be seen in Centreville Presbyterian Church. Before a gristmill was constructed we know that John Deyell walked to a gristmill in Port Hope, carrying his sack of grain on his back there and his sack of flour home. The Deyell mill in Millbrook burned down in 1857. The land was then sold to the Needler family, who were operating mills nearby in Cedar Valley. They constructed a large mill in Millbrook to replace the burnt-out mill. However, in 1909 this mill too suffered the same fate, so a section of the Cedar Valley mill, built in 1830 by Adam Scott, was moved to Millbrook. It is this building that remains today, and is still known as Needler's Mill. Needler’s Mill is still standing in Millbrook because of the efforts of the Millbrook and Cavan Historical Society. MCHS was founded in 1979 expressly to save this mill. www.millbrookcavanhs.org to learn about the Society and to learn more about the history of this area. Ref: This Green & Pleasant Land - Chronicles of Cavan Township (1990). Available on CD from the Historical Society at a cost of $20 plus $3 for shipping in Canada.